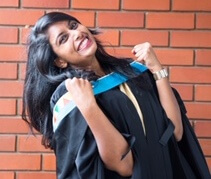 University of KwaZulu-Natal Bachelor of Arts Honours graduate, Germaine Cecil conducted a study on print media’s effect on in-store Point of Sale Materials. As someone who works in print media, she is of the view that “there will always be a space for print media even though a lot of the world is moving digital (in advertising). “It was interesting for me to delve into the field in which I’ve been working for almost six years. It helped me to understand the industry a bit better and the information sourced was beneficial to where I am career-wise. Part of my Honours was coursework and I had the privilege of being lectured on video production by my dad, Jasper, who works for UKZN,” said Cecil. Her findings revealed that while there has been a spike in electronic advertising in digital media which has taken the marketing world by storm, print media remains relevant. “It is still as important as it was when it first emerged in marketing stores. Print media created the foundation for digital media. Though many may question its relevance, retail solutions always call for print media as a primary source of marketing,’ said Cecil. Cecil anticipates that her research findings will be useful to Point-of-Sale advertising, marketing and the print media industry. She is grateful for the support she received from family and friends.